Follow the Dry Acheron Stream to the summit of Big Ben (1416m). Dry Acheron Track • By lewshaw. Licence: cc by-nc-sa. This new track leads up the handsome scrublands of Dry Acheron Stream to climb to the summit of Big Ben (1416m). From here, it is possible to travel along the tops to Ben More (1402m), and it may be possible to drop down to Benmore Hut. On the way, the track passes two covenanted areas, which may be visited as side trips. The track crosses private land. Please use stiles, keep to the trail, and leave gates as found. A variety of vestigial natives sprawl on the flats or cling to the gullies, including matagouri, broadleaf, coprosma, cabbage tree, native broom, kowhai, olearia, and kanuka. The track starts on Coleridge Road 16.5km from Windwhistle, or 1.8km before the Acheron bridge, if you miss it. The car park is signposted but easily overlooked. From the car park, a stile leads to a cow paddock and a trail beneath a pine shelter belt. At the end of the shelter belt, the trail poles lead up a terrace above the stream. After a few minutes, the track drops down to the stream and follows it, crossing several times. The first marked junction is opposite a valley on the true right, and a side track leads up onto a terrace, over a road to the Clay Valley Covenant. This is a fenced off cliff face dotted with cabbage trees and kowhai trees. It doesn't look like it gets many visitors. Further upstream, the track comes to a weir. 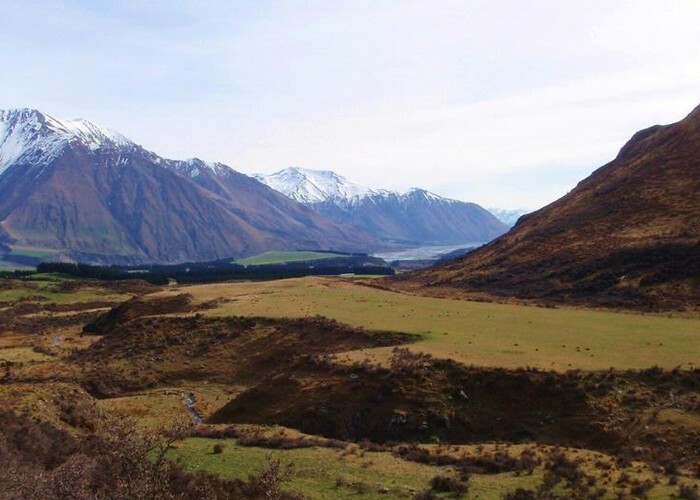 Here, a track leads into the Conical Knoll covenanted area, and a route climbs a spur to Big Ben, at the edge of Korowai/Torlesse Tussocklands Park. Added 30 January 2013 by MatthewMatthew. 1 revision 3 February 2014 by MatthewMatthew.